It’s a big lake but have you ever wondered just how much water it can actually hold? It’s not exactly a small lake and the Bureau of Reclamation who manages releases from Glen Canyon Dam has long recognized their ability to fulfill their obligations under the legislation that originally authorized Glen Canyon Dam is dependent on the amount of water that’s stored in Lake Powell. No water would essentially mean no allocations. 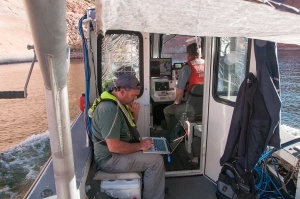 USGS scientists recently mapped the depth of Lake Powell and examined bottom sediment using sophisticated sonar equipment. Early results reveal detailed lake floor topography. Final products will be used to help manage natural resources and Bureau of Reclamation projects such as the Lake Powell Pipeline. Results from the USGS study expected to be released in the next few months, we will share those with you when they have been released.